I am making my first Thanksgiving dinner for the family, which is a group of 10. I’ve eaten many dinners and helped family, but my husband and I have never made the whole dinner. What advice can you offer? Last week I wrote about the importance of planning when you’re hosting Thanksgiving. This week I’m going to cover the menu, portion sizes, and stuffing the bird or not. So, have you planned your menu? Good. Look it over to see what you can do when, and plug those things into your timeline. Pies are a good place to start. Whether you make or buy your pastry, you can make double-crust pies like apple and mincemeat now, and freeze them to bake early in the day on Thanksgiving. Freshly baked pie is the best! 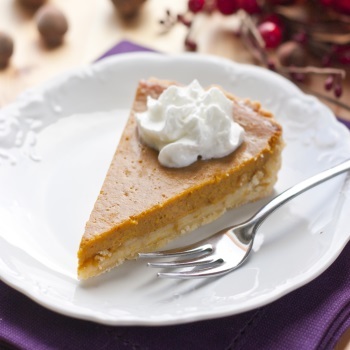 Assemble the pie, place in a heavy plastic zipper-lock bag, and place on a flat surface in the freezer. Later, if you need to move things around in the freezer, the pies can be tilted, but not until they’re frozen. Because you’ll be baking them from the frozen state, you don’t want them to be lopsided. Pies like pumpkin don’t freeze well unbaked. The trick here is to make and freeze the unbaked shell, then parbake, fill, and bake it the day it’s wanted. Pumpkin pie filling is easy to assemble; if you like, you can do that the day before and keep it refrigerated overnight. Bring it to room temperature before baking, or just bake a little longer if you forget. If the edges of the pastry look like they’re getting a little too brown, cover them with aluminum foil or pie shields. How many pies do you need? Well, most everyone loves pie, so make plenty. While three different kinds will be more than 10 people will eat (most likely), it makes a great breakfast. So if you can’t decide what kind will be most popular, don’t – just make ’em all. Side dishes are next. Here again, your freezer is your friend. One of my favorites, baked mashed squash, freezes well. Prepare and put it in a casserole dish that can go into the oven from the freezer, then pop it in the freezer. Wait until you bake it to add any toppings like brown sugar, bread crumbs, or nuts; you don’t want them to get soggy. You might think you can’t freeze mashed potatoes, and ordinarily, that’s so. However, mix in some cream cheese (hint, fat freezes well), and you can. Hold off on making vegetables like green beans, broccoli, Brussels sprouts, carrots, and the like. Green beans, cauliflower, and broccoli can be prepped and blanched a couple of days beforehand; then it’s easy to heat and garnish and/or sauce them on cook day. Cook them until just done in boiling salted water, shock them in cold water to stop the cooking, dry thoroughly, place on paper towels in the storage container, and refrigerate. Root vegetables – carrots, parsnips, rutabagas, beets, etc. – can be peeled and cut up and stored in plastic bags. The very best gravy is made with stock or broth. Turkey broth is ideal for making turkey gravy, but if you don’t want to make it, chicken broth will do. The drippings from the roasted turkey will overcome any chicken flavor. I do suggest simmering the turkey giblets (not the liver, please, which would make the broth bitter) and the neck in the broth for additional flavor. Gravy must be very flavorful, and you must make lots. It’s disappointing not to have leftovers. Hot turkey sandwiches without gravy? Can’t be! Stuffing it is if it’s cooked in the bird; otherwise, it’s dressing. Some swear it must be cooked in the bird for moistness, but it’s not necessary. I once made stuffing with an assortment of dried bread cubes I’d been collecting over the previous year (yes, really – and they were very dry) but all that’s required is stale bread. Please note that sandwich bread, the kind sold in 1–1 ½ pound bags in the supermarket, is lousy for making stuffing. It’s so full of preservatives and dough conditioners that it never really stales. Instead, if it hangs around, it gets moldy, but it never dries out. Your best bet is a good French baguette or Italian loaf, preferably one made of nothing but flour, water, yeast, and salt. You’ll be adding so many good things to it, your stuffing won’t be dry; but neither will it be soggy, which is more unpleasant. Of course, I’m referring to the most basic of stuffings, bread stuffing. You may be of the cornbread persuasion, or wild rice, or some other base. It needn’t be basic, though. Even if you choose to start with a bag of stuffing, which I’ve done in the past, the real flavor comes from the vegetables. I start with diced onions and celery, lots of both, sautéed in lots of butter. Then I add sliced mushrooms and diced red bell peppers. You might like to add crumbled pork sausage or oysters (no need to sauté oysters.) Raisins, chopped apples, dried cherries or cranberries? Why not? If you’re using a large skillet, add the cubed bread to it, or add everything to a large bowl. Mix it well. Season with salt, pepper, thyme, parsley, and sage. Go easy on the sage; it’s an aggressive herb. Does it seem dry? Add broth until it’s a consistency you’re happy with. I hope you used at least one stick of butter; two would have been better. Remember, that bread will soak up a lot of moisture. Don’t worry about making too much. Any stuffing that doesn’t go in the bird can be baked in a casserole dish alongside it. Next week we’ll tackle the pièce de resistance, the turkey.